KUALA LUMPUR, Sept. 24 (Xinhua) -- Closer people-to-people exchanges and relations between Malaysia and China could facilitate greater cooperation under the Belt and Road Initiative, said Malaysia's special envoy to China on Monday. Tan Kok Wai (left)& Lu Zhiqiang (right) signed the agreement. 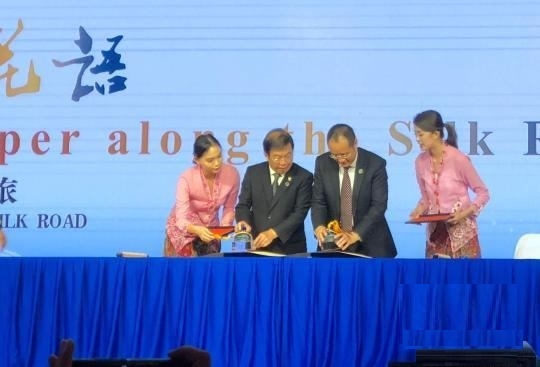 The Belt and Road Initiative emphasizes connectivity of policy, infrastructure, trade, finance and the people, said Tan Kok Wai, Malaysian Prime Minister's special envoy to China and head of the Malaysia-China Business Council. Among the five aspects, the people-to-people connectivity is the most relevant to the public and where ordinary people could contribute, he said during a cultural exchange event hosted here by south China's Guangzhou City. The closer ties between the people could lay a solid foundation for cooperation in areas like infrastructure and trade. "Everything will be gone smoothly as long as the people's hearts and minds are connected," he said. Proposed by China in 2013, the Belt and Road Initiative aims to build trade and infrastructure networks connecting Asia with Europe and Africa on and beyond the ancient Silk Road routes. It comprises the Silk Road Economic Belt and the 21st Century Maritime Silk Road. Tan mentioned that during the recent visit by Malaysian Prime Minister Mahathir Mohamad to China, the Malaysian government has clearly stated that "we welcome, support and will continue to participate in the Belt and Road cooperation." The Belt and Road is a road of mutual respect and mutual trust; a road of win-win cooperation and a road of mutual understanding said Tan. "Let us work together to create a new chapter for the new Silk Road and share the fruitful results of the 'Belt and Road'," he added. The event, named "Floral whisper along the Silk Road - Cultural Journey of Maritime Silk Road", featuring cultural performance, symposium and exhibition, is aimed at promoting people-to-people friendship as well as the cooperation in research and preservation of the heritage of the ancient Silk Road.